Can RegenePure Treat Hair Loss? Regenepure is an innovative and reliable brand focused on bringing you the best hair loss products for men and women on the market. The three main products under the Regenepure name are: Regenepure DR hair regrowth shampoo, Regenepure NT, and Regenepure Precision Minoxidil Spray. Regenepure DR is a hair loss shampoo that contains Ketoconazole, which is clinically proven to remove build up on the scalp and help promote hair growth and curb hair loss. Regenepure DR is a hair loss shampoo for men and women. Regenepure NT deeply moisturizes the scalp and hair strands to revitalize your locks into healthy and strong hair. The Regenepure Precision Minoxidil Spray is a hair loss treatment that allows for direct targeting of your bald spots with its swivel applicator, without the mess of a foam or dropper foam. Together, all three products will help regrow hair, revitalize your hair strands, and bring life back to your hair. Regenepure DR is a hair loss shampoo for men and women. The DR's main ingredient, Ketoconazole, treats dandruff and also disrupts the production of DHT, which helps curb hair loss, while stimulating hair growth on the scalp. Regenepure DR is specially formulated to cleanse the scalp of all impurities and toxins, while repairing the hair strands from root to tip. Regenepure DR is free of all sulfates, parabens, harsh chemicals and DEA, making it one of the safest products to use on hair that has been coloured, keratin or chemically treated. Regenepure NT deeply nourishes your scalp and hair in one simple step. With ingredients such as Lecithin, Caffeine and Saw Palmetto Extract, Regenepure NT helps stimulates hair growth on the scalp, while its restorative properties bring your hair back to optimum health. The NT acts as a hair loss treatment in conjunction with Regenepure DR to give you the results you have been seeking. 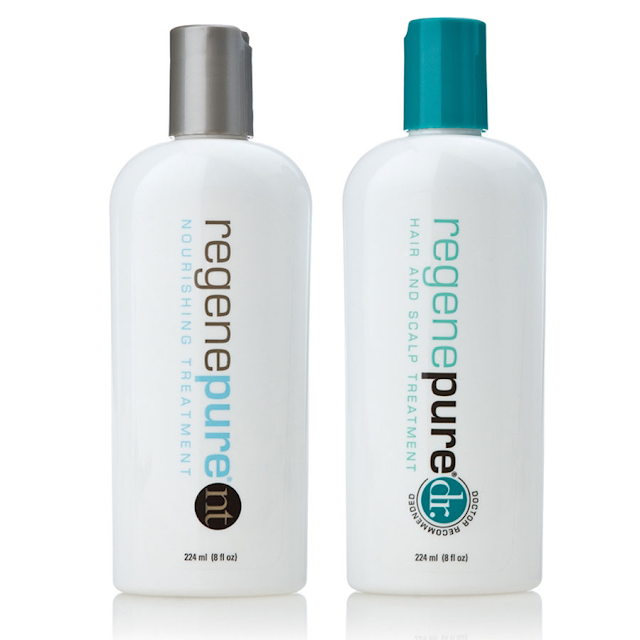 Regenepure NT is also free of all sulfates, parabens, and harsh chemicals.